In this first part of an extended article, Peter Jenkins sets out the current context in which psychotherapy research is taking place and argues that university ethics committees are becoming increasingly concerned with rules and risks. Involvement in university-based research activity is normally taken as a hallmark of any established profession, and this is increasingly true of psychotherapy, as an emerging professional community. This can be seen in the massive growth of psychotherapy training courses at postgraduate and doctoral level, either based directly in universities in the UK, or in practitioner training institutions which enjoy close links with external validating university bodies. Research can add to the overall credibility of the professional community, provide evidence of the effectiveness of its therapeutic models and interventions, and expand the growing body of knowledge about theory and practice. However, the core assumptions about the nature of knowledge underpinning research can often be overlooked. These assumptions may actually govern and police the research process and the ways in which decisions about psychotherapy research activity are applied in practice. Unpicking the current status of psychotherapy research needs to be part of a wider exploration of the overall position of psychotherapy itself. Psychotherapy currently lacks some of the key features of an established profession, despite its growing investment in research activity (Jenkins 2017). Crucially, psychotherapy in the UK has so far failed on two separate occasions to achieve statutory regulation, either by practice, or by title, and it seems unlikely to do so in the foreseeable future (Jenkins 2017). It is, therefore, best defined as a ‘community of practice’, or as an emerging professional community, with continuing aspirations to achieve full professional status. Discussion of professional status inevitably means addressing issues of hierarchy, power and control, not least internally over its own members and trainees. 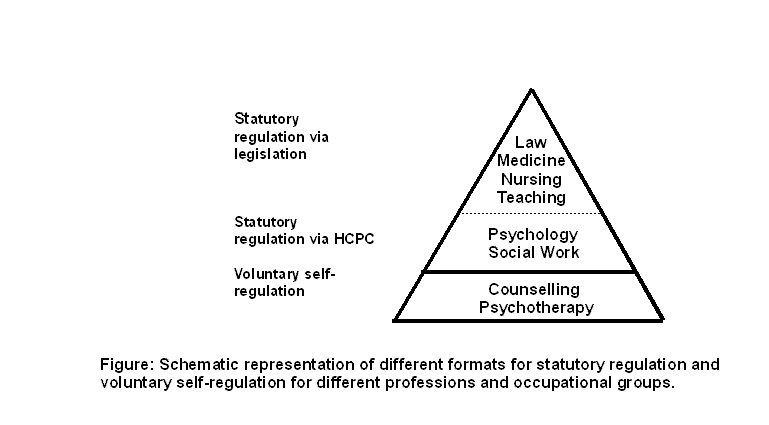 In addition, there is an external hierarchy of power and control, which applies between different professional groups (see Diagram 1: Schematic representation of different formats for statutory regulation and voluntary self-regulation for different professions and occupational groups). This is not to say that this type of hierarchy is desirable, but simply to acknowledge that certain professions, particularly law and medicine, enjoy a high degree of social power and control within society. This degree of social power is greater than that held by other subordinate professional groups, such as nursing, teaching, psychology and social work, despite the fact that each of these are also regulated by law. It could even be argued that statutory regulation, in this case via the Health and Care Professions Council (HCPC), can lead to a tightening of hierarchical control over certain professional groups, and a corresponding loss of status. Social work would be a prime example of this process at work, evidenced by the loss of its unique role in relation to mental health admissions. Counselling and psychotherapy are subject to voluntary self-regulation, with accredited registers of practitioners, but lack any legally enforceable monopoly over title or practice, and are thus lowest in the hierarchy of professions, with law and medicine at the top. A simple example might suffice: therapist associations will often appoint legally-qualified personnel to senior positions within their own organisations, or seek paid legal consultancy, to provide expert advice on key legal issues. Equivalent examples of therapists being appointed to provide therapeutic advice, on a similar, permanent, and very senior basis to legal associations, such as the Law Society, are, no doubt, relatively rare. In terms of the hierarchy placing the medical profession over psychotherapy, we find that this structure is maintained primarily through medicine’s control over the psychotherapy research agenda, exercised largely via university research ethics committees. This hierarchical model of professional power, with law and medicine in a dominant position, has very real consequences for the activities and practices of subordinate professional groups, such as psychotherapy. This can be identified in the case of research. The dominant medical model of research applied within university settings is a Popperian, positivist approach towards science. This is clearly visible in the well-established definition of research, as “the attempt to derive generalisable new knowledge by addressing clearly defined questions with systematic and rigorous methods” (Department of Health 2005, para 1.10). All research does clearly need to be systematic and to use rigorous methods, but not all research activities or methods will necessarily produce new knowledge which is potentially generalisable to other populations, for example, in the case of most qualitative studies. A detailed qualitative exploration of a very small sample of bereaved clients’ experiences may produce valuable knowledge of that same small sample, but any application to other similar or dissimilar groups of clients will be very speculative in nature. The Department of Health definition risks privileging quantitative over qualitative research, and carries an inherent risk of conflating research into the natural world with investigating the social world. Psychotherapy clearly does need to make full use of quantitative research, e.g. in the form of outcome studies. It also necessarily holds a strong commitment to exploring and understanding the role of socially-constructed and experiential aspects of therapy, such as the therapeutic alliance, which are not easily captured by purely empirical research methods. In terms of applying research models, there has been a significant shift towards rule-based approaches, centring on the use of university research ethics committees. Gone are the days when ‘research’ was based largely on the authority of powerful individuals, whether in the medical field, as at Alder Hey Hospital, or Bristol Royal Infirmary, or, in the case of social psychology, of charismatic individuals such as Milgram and Zimbardo (Jenkins 2013). University research ethics committees apply increasingly detailed protocols for evaluating research proposals, in a deontological, or rule-based, manner. Given the subordinate and less powerful position of psychotherapy research within university settings, this can result in proposals for psychotherapy research being subject to unsympathetic scrutiny, given that the established medical research paradigm favours quantitative research and a positivist model of science. The dominance of quantitative research models over qualitative research within therapy can be illustrated by reference to the dominant position held within the NHS by evidence-based practice. This is formalised by the National Institute for Health and Care Excellence (NICE) guidelines, which are, in turn, based on systematic meta-analyses and randomised controlled trials. The net effect of this medical model of research when applied to psychotherapy research has been to establish Cognitive Behavioural Therapy (CBT) as the dominant and preferred model of treatment for psychological disorders within the NHS. CBT has a well-established evidence base, founded on the widespread use of randomised controlled trials, which are consistent with a medicalised model of research. There has been a significant shift within psychotherapy practice away from principle-based ethics, such as avoidance of harm and respecting client autonomy, towards increasingly prescriptive rule-based approaches. In the case of the British Association for Counselling and Psychotherapy, these rules may have been reframed as ‘commitments’ to soften their impact on members, but they retain the status of rules, nevertheless (BACP, 2018). Or, as Bond puts it “We are having to be more directive” (Jackson 2018, p9). Bond sees developments in medical ethics as a key point of reference for the development of a revised set of ethics for counselling and psychotherapy (Bond 2015). There has been a parallel shift within research ethics for therapists, away from principle-based ethics, towards a much more prescriptive and rule-bound approach. The original guidance for research in therapy, a rather slim document of 12 pages (Bond 2004), has been replaced by a much more detailed and legalistically-framed rule-based version (Mitchels 2018), which now runs to 129 pages. This strengthening of psychotherapy research ethics as a deontological, rule-based enterprise, exercised via university ethics committees, has led the process of gaining ethical approval for psychotherapy research proposals to be seen as an increasingly bureaucratic process, which, at times, “is driven by a desire to protect the institution” (Danchev and Ross 2014, p106). University research ethics committees have been the subject of a range of different critiques. Goldacre (2012), for example, favours open data, i.e. where working research data can be made available to other researchers. He critiques the role of university ethics committees in relation to medical research, on the grounds that they do not insist on publication of all research outcomes, including those with negative, or inconclusive, outcomes. Along the way, he notes in passing the lack of any evidence base for the effectiveness of ethics committees themselves, in that they “have collectively failed to produce research demonstrating the value of the interventions they force researchers to comply with” (Goldacre 2012, p234). From a different perspective, Yorke (2017) argues that ethics committees are preventing research into controversial areas, such as transgenderism. Clearly, it must be acknowledged that there are risks associated with carrying out research. Examples might include research by Northumbria University, where two students were given near-fatal overdoses of caffeine, leading to a fine of £400,000 (Weaver 2017). Another example of risk is the case of Giulio Regeni, who was tortured and killed in Egypt while carrying out research on trade unions for his PhD at Cambridge University (Kirchgaessner and Michaelson 2018). University ethics committees can make correct decisions on assessing the risk of harm to participants, or of a breach in data protection law. The Cambridge University ethics committee, for example, rejected a research proposal to use Facebook personal data without safeguards for ensuring user consent (Weaver 2018). However, the overall estimation of risk by university ethics committees seems to be set far too high. This is the case with regard to a number of areas, namely the risk of causing emotional distress to respondents, the risk of triggering litigation for financial compensation, and the risks involved in research with young people. This article will continue in the next issue, exploring risks that concern university ethics committees, particularly the risk of causing respondent distress, the risk of the university being sued, and risks involved in researching young people. Part 2 will also discuss excluded research topics and chart the impact of university ethics committees on psychotherapy research. This article is based on a paper entitled “Hegemony and risk in psychotherapy research” for the Centre for Psychoanalytic Studies at the University of Essex in February 2017. Thanks to Jochem Willemsen and Werner Kierski for their comments and support. Bond, T. (2004). Ethical Guidelines for Researching Counselling and Psychotherapy. Lutterworth: BACP. Bond, T. (2015). “New challenges for professional ethics and good practice guidelines for counsellors, psychotherapists and psychologists”, pp. 7-18, in R. Tribe and J. Morrissey (eds), Handbook of Professional and Ethical Practice for Psychologists, Counsellors and Psychotherapists. Second edition. London: Routledge. British Association for Counselling and Psychotherapy (2018). Ethical Framework for the Counselling Professions. Lutterworth: BACP. Department of Health (2005). Research Governance Framework for Health and Social Care. Second edition. London: Department of Health. Goldacre, B. (2012). “How ethics committees and universities have failed us”, pp. 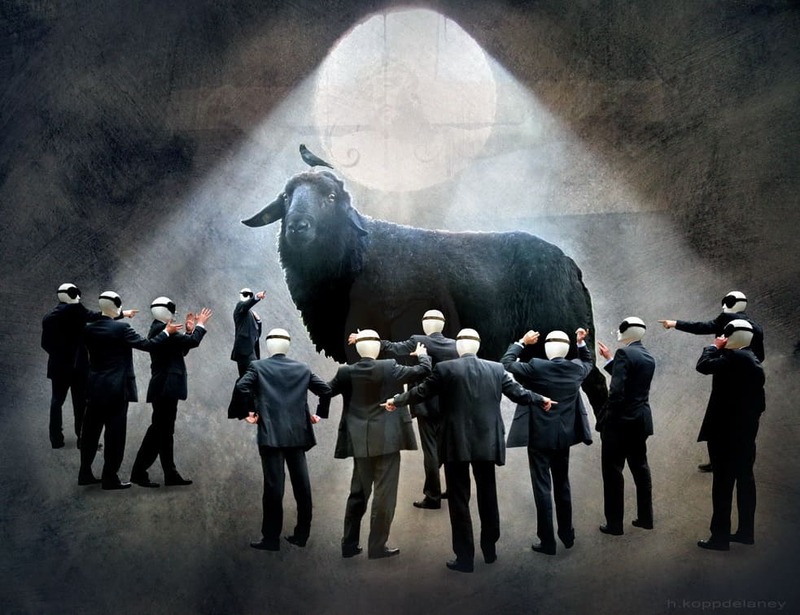 37-44, in Bad Pharma: How Drug Companies Mislead Doctors and Harm Patients. London: Fourth Estate. Jackson, C. (2018). “The only way is ethics”, Therapy Today, 29(6), pp 8-11. Jenkins, P. (2017). Professional Practice in Counselling and Psychotherapy: Ethics and the Law. London: Sage. Kirchgaessner, S. and Michaelson, R. (2018). “Blame game over death of PhD student in Egypt”, Guardian, 3rd January. Mitchels, B. (2018). Ethical Guidelines for Research in the Counselling Professions. Lutterworth: BACP. Weaver, M. (2017). “Pair given near-fatal dose of caffeine”, Guardian, 26th January. Weaver, M. (2018). “Cambridge panel rejected Facebook research project”, Guardian, 25th April. Yorke, H. (2017). “Academics say research hindered by universities’ fear of online backlash”, Sunday Telegraph, 24th December.